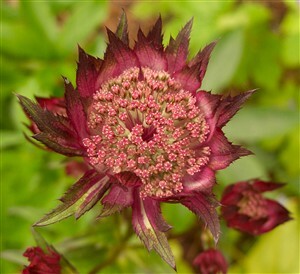 Astrantia 'Hadspen Blood' (Hatty's Pin Cushion) Very dark maroon flowers on purple stems, like all Astrantias excellent for heavy clay soil. Reflowers well on a richer soil and dead headed. Good in shade.